500 Watts. SATA 2 IDE 3 heads head. 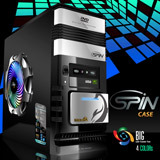 Fan power LED 4 Colors Case 15 cm and 8 cm 1 fan PowerSupply. Front panel with USB to 2 Port and version 2.0.